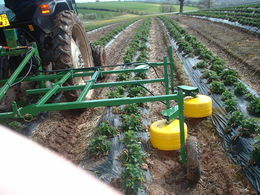 Available in CDA (Controlled Droplet Application) or traditional pressure nozzle option, Flexidome is a shielded tractor-mounted sprayer which has been specifically developed for weed control in soft fruit grown in raised beds outdoors or in Spanish tunnels. 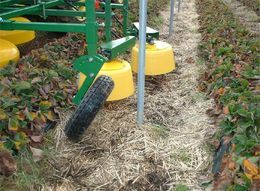 Rotary atomisers or pressure nozzles are mounted under spring loaded circular shields which rotate freely against the bed. 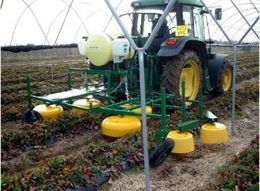 This enables growers to spray right up to the shoulder of the bed resulting in efficient weed control and significant labour savings. 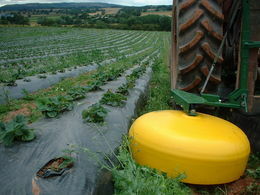 The spray heads contain the droplets and minimise drift, thus enabling the spraying operation to be carried out in a wider range of weather conditions. 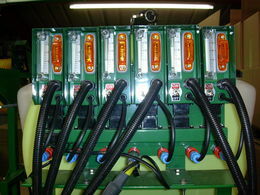 Flexidome is usually supplied in a four head configuration with the ability to treat inter-row widths of 0.5 to 1 metre. 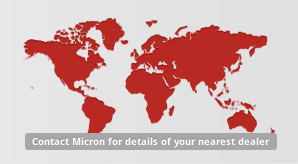 A 200 litre tank is supplied as standard. 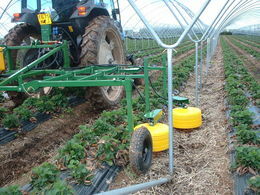 An optional 'leg row sprayer' is available which enables growers to spray the leg of the polytunnel at the same time as the inter-row in the beds. 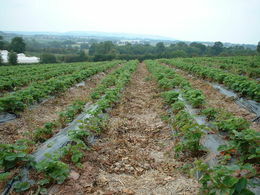 A five bed tunnel can be sprayed in two passes.